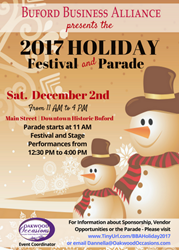 The Buford Business Alliance (BBA) is hosting their annual Holiday Parade and Festival on December 2nd, 2017 on Main Street in Historic Buford, GA. This year’s event marks the 15th year the city has welcomed Santa’s arrival the first Saturday of December at annual event. 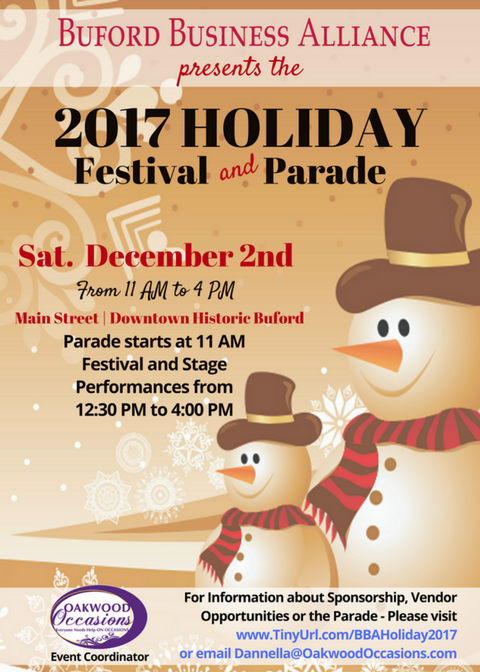 Each year the Buford Business Alliance teams up with the City of Buford to host this one of a kind event that shuts down main street for a chance for families to experience a one of a kind Holiday event. Parade participation is a great mix of local schools, businesses, and organizations that get to share their holiday spirit with on-lookers on Main Street. This year’s event kick-offs with the parade route starting at Tannery Row and winding its way down to the historic Bona Allen Mansion at 11 am on December 2nd, 2017. The parade always end with Santa arriving in Buford for pictures with children at the festival located in front of the mansion. Vendors will be on hand with food, hand made goods, and to share their businesses with the community from the end of the parade to 4 PM. Many local performance groups will be participating with stage performances throughout the day. This annual outdoor event happens rain or shine. For those interested, there are several ways to participate and registration is required to get involved. There are still opportunities to participate in this year’s event. For inquiries about becoming a vendor, participating in stage performances, or join the parade http://pin contact Oakwood Occasions. Everyone is invited to come out and enjoy the Free festival and performances throughout the day. The Buford Business Alliance is a non-profit organization created to promote goodwill, business and tourism to benefit local businesses, The City of Buford and the community in the Buford area. The organization meets for business afterhours on the second Tuesday of every month at business located around the Buford community.